Makes a GameObject being rendered from an orthographic (2D) camera, appear to follow a target being rendered by another camera, in another space, such as the MainCamera in World (3D) space. This is perfect for use with most sprite-based GUI plugins to make a GUI element follow a 3D object. For example, a life bar can be setup to stay above the head of enemies. The limiting features can be used to make arrows point to enemies that are off-screen, and more. The object being rendered by theTarget Camera which the constrained object (rendered by the Output Camera) will follow. 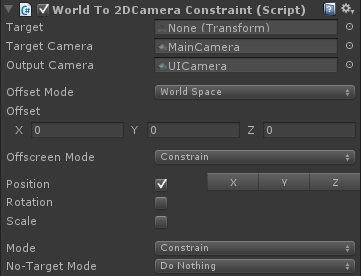 The camera that will render the Target object which this constrained object will follow. The camera that will render this constrained object. Used to determine the behavior of the object when the Target moves off-screen.